For making the crust: Whisk together flour, sugar and salt. Sprinkle the butter cubes over the flour and begin working them in with the pastry blender (called “cutting the dough”), using it to scoop to redistribute the butter pieces throughout the bowl (Don’t cut the dough to much – you should still be able to see small pieces of butter). Mix together water and bourbon in a small glass. Sprinkle the bourbon mixture over the dough in thirds, gently mixing with a rubber spatula – don’t overmix, the dough should just come together. Place dough onto a lightly floured surface, and knead just enough to form a disc. There should still be small chunks of butter visible – this is what makes a flaky, golden crust! Sprinkle a little flour around the disc, and wrap in plastic wrap – chill in the refrigerator for at least 2 hours or overnight. Remove disc from the refrigerator, and allow to sit for 10 minutes at room temperature (this will make rolling it out much easier). Dust a rolling pin with flour and lightly flour a flat surface – roll dough out into a 12-inch circle, about 1/8 of an inch thick. Using the rolling pin, carefully roll dough up dough to lift. Carefully unroll the dough into the pie dish, and gently press down so it lines the dish. Cut overhanging dough to half an inch, and fold remaining dough underneath; use a fork or fingers to create a decorative edge. Place dough in freezer while preparing filling and preheat oven to 350 degrees F.
For the filling: in a standing mixer with the whisk attachment, whip together the butter, sugars, corn syrup, eggs, vanilla, and bourbon until fluffy. Gently fold in the chocolate chips and walnuts. Remove pie crust from freezer, and pour in the filling – bake for 50 to 60 minutes, or until set. For ganache (optional): place chocolate chips into a heatproof bowl; bring heavy cream to a boil in a small saucepan over medium heat – pour over chocolate chips and allow to sit for at least one minute. Slowly whisk, starting from the center and working outwards, until fully melted. Allow to cool for about 5 minutes – pour ganache over pie, and allow to sit for 30 minutes before serving. 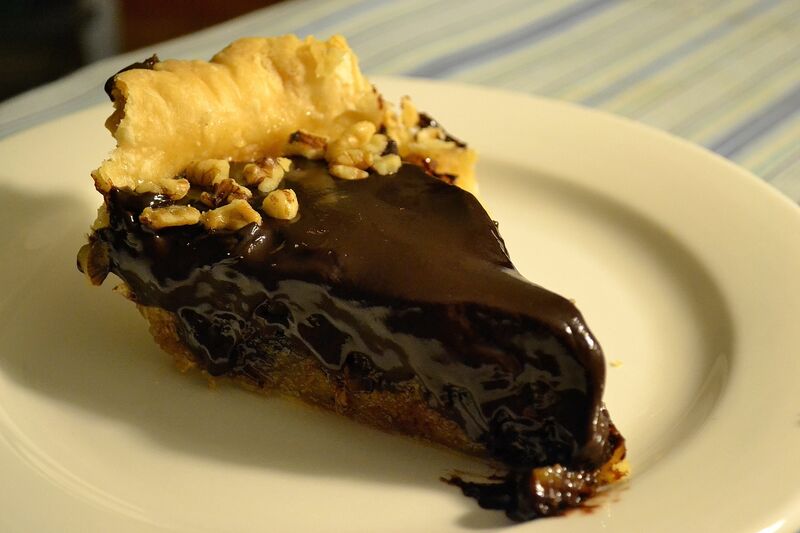 Read more about this pie and my musical pairing by clicking HERE.